Prayer is powerful beyond limits when we turn to the Immaculata who is queen even of God’s heart. Do you have a favorite mystery of the Rosary? One that causes more reflection and contemplation in your prayer life? One that makes you slow down during prayer and savor every moment? Recently, I was asked this same question, and I have to admit, I was a bit stumped. I had never thought about a favorite mystery. Quickly, I realized, that my favorite changes with my life’s circumstances and even with the liturgical seasons. Once during Advent, a priest encouraged me to imagine myself at the Nativity, asking Mary if I could hold her baby. He wanted me to enter the story and contemplate what it would be like to hold the Son of God in my arms, so as to grasp God’s unconditional love for me. For a long time, whenever I prayed the mystery of the Nativity, I remembered this and could easily get lost in the little town of Bethlehem. Lately, I have been contemplating the Coronation of Mary as Queen of Heaven and Earth. I just joined a Living Rosary, which involves 20 people praying their one, assigned mystery every day, so that all 20 mysteries are being prayed daily for the group’s intentions. You can pray this decade as part of an entire Rosary or just on its own. Writing this 31-day challenge, along with praying this mystery more, has led me to contemplate Mary’s role as my queen, my lady. What type of queen is Our Blessed Mother? She is certainly royal. After all, her Son is the King of kings and Lord of lords! She also is “full of grace,” and from what we read in Scripture, she is humble, kind, loyal, and joyful. If fairy tales can be allegories for reality, the princess most closely resembling Mary would have to be Cinderella. I imagine Mary being the queen that every common villager loves, like Cinderella, but even more beautiful and kind. The people relate to Mary, and she makes them feel at ease. It is as if she wants them to recognize her as one of them. After all, she, too, used to walk to the well for water, cook on an open fire, and wash clothes in the stream. I envision her coming to the people from her castle on high. She glows with the light of Christ, and her smile blesses everyone whom she passes. Mary tends to those in need. She feeds the hungry, visits the lonely, and comforts those who are sad. She listens to the prayers and petitions of each and every person that she encounters. She recognizes their great need for her Son, and she files all of their requests in her heart, to share with Him when she gets home. Even though the people’s problems may still remain at the end of her visit, she encourages them to “do whatever [the King] tells you,” and their hope is instantly restored (John 2:5). 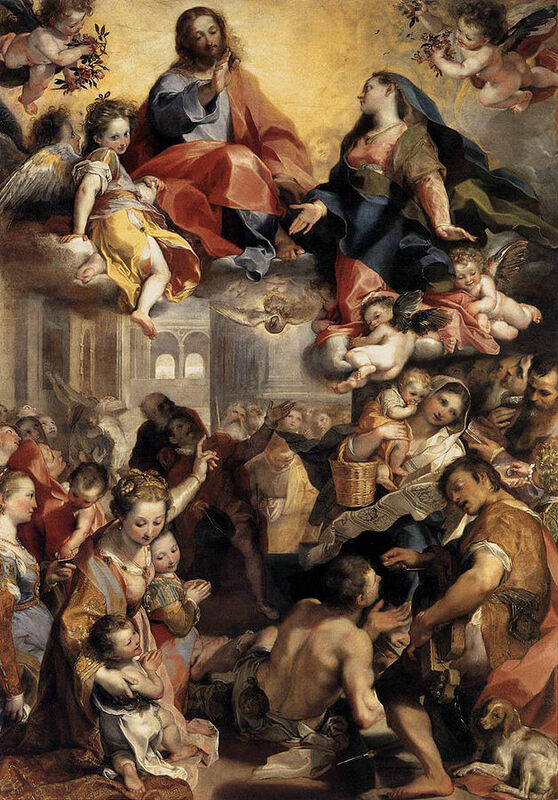 “Barocci—Madonna del Popolo” by Federico Barocci, Web Gallery of Art . Licensed under Public Domain via Commons. When she returns to her castle at the end of a long day, she prepares to meet up with Jesus, her Son. She takes out a gold platter and begins arranging each villager’s needs, desires, hopes and dreams upon it. She lifts it gently, and presents it to Jesus. He receives the people’s prayers through His mother, and He is delighted. He is happy to answer all of them, according to His Father’s will. The queen’s work is never done. She listens to every Hail Mary and Memorare. She holds the hand of each person who prays the Rosary, and she breathes in the aroma of the lovely flowers placed before her statue in churches around the world. Mostly, she enters the hearts of all those who pray and show her devotion, and she points them to her Son. In turn, they grow closer to the King, because of the queen’s intercession. We never give more honor to Jesus than when we honor his Mother, and we honor her simply and solely to honor him all the more perfectly. We go to her only as a way leading to the goal we seek—Jesus, her Son. Do you have a favorite mystery of the Rosary? If so, please share it with us in the comments below.